I was crossing the area at its widest point, and after three days' walking, found myself in the midst of unparalleled desolation. I camped near the vestiges of an abandoned village. I had run out of water the day before, and had to find some. These clustered houses, although in ruins, like an old wasps' nest, suggested that there must once have been a spring or well here. There was indeed a spring, but it was dry. The five or six houses, roofless, gnawed by wind and rain, the tiny chapel with its crumbling steeple, stood about like the houses and chapels in living villages, but all life had vanished. After five hours' walking I had still not found water and there was nothing to give me any hope of finding any. All about me was the same dryness, the same coarse grasses. I thought I glimpsed in the distance a small black silhouette, upright, and took it for the trunk of a solitary tree. In any case I started toward it. It was a shepherd. Thirty sheep were lying about him on the baking earth. He gave me a drink from his water-gourd and, a little later, took me to his cottage in a fold of the plain. He drew his water - excellent water - from a very deep natural well above which he had constructed a primitive winch. It was understood from the first that I should spend the night there; the nearest village was still more than a day and a half away. And besides I was perfectly familiar with the nature of the rare villages in that region. There were four or five of them scattered well apart from each other on these mountain slopes, among white oak thickets, at the extreme end of the wagon roads. They were inhabited by charcoal burners, and the living was bad. Families, crowded together in a climate that is excessively harsh both in winter and in summer, found no escape from the unceasing conflict of personalities. Irrational ambition reached inordinate proportions in the continual desire for escape. The men took their wagonloads of charcoal to the town, then returned. The soundest characters broke under the perpetual grind. The women nursed their grievances. There was rivalry in everything, over the price of charcoal as over a pew in the church, over warring virtues as over warring vices as well as over the ceaseless combat between virtue and vice. And over all there was the wind, also ceaseless, to rasp upon the nerves. There were epidemics of suicide and frequent cases of insanity, usually homicidal. There was peace in being with this man. The next day I asked if I might rest here for a day. He found it quite natural - or, to be more exact, he gave me the impression that nothing could startle him. The rest was not absolutely necessary, but I was interested and wished to know more about him. He opened the pen and led his flock to pasture. Before leaving, he plunged his sack of carefully selected and counted acorns into a pail of water. I noticed that he carried for a stick an iron rod as thick as my thumb and about a yard and a half long. Resting myself by walking, I followed a path parallel to his. His pasture was in a valley. He left the dog in charge of the little flock and climbed toward where I stood. I was afraid that he was about the rebuke me for my indiscretion, but it was not that at all: this was the way he was going, and he invited me to go along if I had nothing better to do. He climbed to the top of the ridge, about a hundred yards away. The following year came the War of 1914, in which I was involved for the next five years. An infantry man hardly had time for reflecting upon trees. To tell the truth, the thing itself had made no impression upon me; I had considered as a hobby, a stamp collection, and forgotten it. The countryside had not changed. However, beyond the deserted village I glimpsed in the distance a sort of grayish mist that covered the mountaintops like a carpet. Since the day before, I had begun to think again of the shepherd tree-planter. "Ten thousand oaks," I reflected, "really take up quite a bit of space." I had seen too many men die during those five years not to imagine easily that Elzeard Bouffier was dead, especially since, at twenty, one regards men of fifty as old men with nothing left to do but die. He was not dead. As a matter of fact, he was extremely spry. He had changed jobs. Now he had only four sheep but, instead, a hundred beehives. He had got rid of the sheep because they threatened his young trees. For, he told me (and I saw for myself), the war had disturbed him not at all. He had imperturbably continued to plant. He had pursued his plan, and beech trees as high as my shoulder, spreading out as far as the eye could reach, confirmed it. He showed me handsome clumps of birch planted five years before - that is, in 1915, when I had been fighting at Verdun. He had set them out in all the valleys where he had guessed - and rightly - that there was moisture almost at the surface of the ground. They were as delicate as young girls, and very well established. Creation seemed to come about in a sort of chain reaction. He did not worry about it; he was determinedly pursuing his task in all its simplicity; but as we went back toward the village I saw water flowing in brooks that had been dry since the memory of man. This was the most impressive result of chain reaction that I had seen. These dry streams had once, long ago, run with water. Some of the dreary villages I mentioned before had been built on the sites of ancient Roman settlements, traces of which still remained; and archaeologists, exploring there, had found fishhooks where, in the twentieth century, cisterns were needed to assure a small supply of water. The wind, too, scattered seeds. As the water reappeared, so there reappeared willows, rushes meadows, gardens, flowers, and a certain purpose in being alive. But the transformation took place so gradually that it became part of the pattern without causing any astonishment. Hunters, climbing into the wilderness in pursuit of hares or wild boar, had of course noticed the sudden growth of little trees, but had attributed it to some natural caprice of the earth. That is why no one meddled with Elzeard Bouffier's work. If he had been detected he would have had opposition. He was undetectable. Who in the villages or in the administration could have dreamed of such perseverance in a magnificent generosity? In 1993 he received a visit from a forest ranger who notified him of an order against lighting fires out of doors for fear of endangering the growth of this natural forest. It was the first time, that man told him naively, that he had ever heard of a forest growing out of its own accord. At that time Bouffier was about to plant beeches at a spot some twelve kilometers from his cottage. In order to avoid travelling back and forth - for he was then seventy-five - he planned to build a stone cabin right at the plantation. The next year he did so. In 1935 a whole delegation came from the Government to examine the "natural forest". There was a high official from the Forest Service, a deputy, technicians. There was a great deal of ineffectual talk. It was decided that some thing must be done and, fortunately, nothing was done except the only helpful thing: the whole forest was placed under the protection of the State, and charcoal burning prohibited. For it was impossible not to be captivated by the beauty of those young trees in fullness of health, and they cast their spell over the deputy himself. In the direction from which we had come the slopes were covered with trees twenty to twenty-five feet tall. I remembered how the land had looked in 1913: a desert ... Peaceful, regular toil, the vigorous mountain air, frugality and, above all, serenity of spirit had endowed this old man with awe-inspiring health. He was one of God's athletes. I wondered how many more acres he was going to cover with trees. Before leaving, my friend simply made a brief suggestion about certain species of trees that the soil here seemed particularly suited for. He did not force the point. "For the very good reason," he told me later," that Bouffier knows more about it than I do." At the end of an hour's walking - having turned it over his mind - he added, "He knows a lot more about it than anybody. He's discovered a wonderful way to be happy!" The only serious danger to the work occurred during the war of 1939. As cars were being run on gazogenes (wood-burning generators), there was never enough wood. Cutting was started among the oaks of 1910, but the area was so far from any rail roads that the enterprise turned out to be financially unsound. It was abandoned. The shepherd had seen nothing of it. He was thirty kilometers away, peacefully continuing his work, ignoring the war of '39 as he had ignored that of '14. I saw Elzeard Bouffier for the last time in June of 1945. He was then eighty-seven. I had started back along the route through the wastelands; by now, in spite of the disorder in which the war had left the country, there was a bus running between the Durance Valley and the mountain. I attributed the fact that I no longer recognized the scenes of my earlier journeys to this relatively speedy transportation. It seemed to me, too, that the route took me through new territory. It took the name of a village to convince me that I was actually in that region that had been all ruins and desolation. The bus put me down at Vergons. In 1913 this hamlet of ten or twelve houses had three inhabitants. They had been savage creatures, hating one another, living by trapping game, little removed, both physically and morally, from the conditions of prehistoric man. All about them nettles were feeding upon the remains of abandoned houses. Their condition had been beyond hope. For them, nothing but to await death - a situation which rarely predisposes to virtue. Everything was changed. Even the air. Instead of the harsh dry winds that used to attack me, a gentle breeze was blowing, laden with scents. A sound like water came from the mountains: it was the wind in the forest. Most amazing of all, I heard the actual sound of water falling into a pool. I saw that a fountain had been built, that it flowed freely and - what touched me most - that some one had planted a linden beside it, a linden that must have been four years old, already in full leaf, the incontestable symbol of resurrection. Besides, Vergons bore evidence of labour at the sort of undertaking for which hope is required. Hope, then, had returned. Ruins had been cleared away, dilapidated walls torn down and five houses restored. Now there were twenty-eight inhabitants, four of them young married couples. The new houses, freshly plastered, were surrounded by gardens where vegetables and flowers grew in orderly confusion, cabbages and roses, leeks and snapdragons, celery and anemones. It was now a village where one would like to live. From that point on I went on foot. The war just finished had not yet allowed the full blooming of life, but Lazarus was out of the tomb. On the lower slopes of the mountain I saw little fields of barely and of rye; deep in the narrow valleys the meadows were turning green. It has taken only the eight years since then for the whole countryside to glow with health and prosperity. On the site of ruins I had seen in 1913 now stand neat farms, cleanly plastered, testifying to a happy and comfortable life. The old streams, fed by the rains and snows that the forest conserves, are flowing again. Their waters have been channelled. On each farm, in groves of maples, fountain, pools overflow on to carpets of fresh mint. Little by little the villages have been rebuilt. People from the plains, where land is costly, have settled here, bringing youth, motion, the spirit of adventure. Along the roads you meet hearty men and women, boys and girls who understand laughter and have recovered a taste for picnics. Counting the former population, unrecognisable now that they live in comfort, more than ten thousand people owe their happiness to Elezeard Bouffier. World Environment Day is usually "celebrated" on or about June 5 every year - and what does this mean to you, dear reader? With the opening of the third millennium, the earth is in serious trouble. Pollution is ravaging the cities. Deserts are swamping the green earth. Our forest resources are being depleted as trees continue to be felled indiscriminately. Various species are getting extinct. As a result of man's greed and callousness, less than 500 tigers remain. The leopard, the elephant and the turtle are also in dire straits. The polar ice-cap is said by scientists now only to be half as thick as it was 100 years ago, and by the ned of this century - nay, probably well before that - the oceans over the top of the north pole could well only freeze over during the inter months (all of which is flatly contradicted by the USA, who believe the rest of Europe is scare-mongering). In such a scenario, efforts at conservation, sustainable development and global co-operation can save the earth. Written in 1954, the story has been translated into a dozen languages. It has long since inspired reforestation efforts, world-wide. The hero of Giono's tale planted hope and grew happiness. He could, but of course, be Everyman. 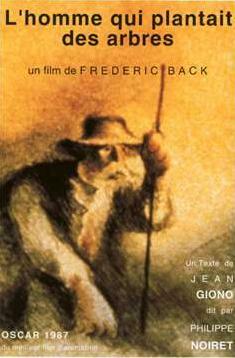 It is a story of one man's love for the good earth, and it is written by Jean Giono, one of the greatest French writers. The book is illustrated with wood engravings by Michael McCurdy with an afterword by Norma L.Goodrich. IndiaWorld dedicates Giono's story to our very own. First published in 1954 by Vogue magazine, Jean Giono's story has been translated into at least a dozen languages. It has since inspired reforestation efforts, worldwide. Giono was a self-taught man. He lived virtually his entire life in the little city of Manosque in France. His elderly father was a cobbler and his mother, he tells us in his early novel jean le bleu (Blue Boy), ran a hand laundry. This family of three resided in the poorest of tenements where the child had only a blue view down into the well, or courtyard. At age sixteen, becoming sole support of the family, Giono left school and went to clerk in a bank. Eighteen years later, in 1929, he published his first two novels, Colline (Hill of Destiny) and Un de Baumugnes (Lovers Are Never Losers), both rave success, in part thanks to the instant sponsorship of Andre Gide. Years afterward Giono recalled the turning point in his life, to a moment in the afternoon of December 20, 1911, when he could spare enough pennies to purchase the cheapest book he could find. It turned out to be a copy of Virgil's poems. He never forgot that first flush of his own creative energy: "My heart soared." Giono ran into difficulties with the American editors who in 1953 asked him to write a few pages about an unforgettable character. Apparently the publishers required a story about an actual unforgettable character, while Giono chose to write some pages about that character which to him would be most unforgettable. When what he wrote met with the objection that no "Bouffier" had died in the shelter at Banon, a tiny mountain hamlet, Giono donated his pages to all and sundry. Not long after the story was rejected, it was accepted by Vogue and published in March 1954 as "The Man Who Planted Hope and Grew Happiness." Giono later wrote an American admirer of the tale that his purpose in creating Bouffier "was to make people love the tree, or more precisely, to make them love planting trees." Giono interpreted the "character," as an individually unforgettable if unselfish, generous beyond measure, leaving on earth its mark without thought of reward. Giono believed he left his mark on earth when he wrote Elzeard Bouffier's story because he gave it away for the good of others, heedless of payment: It is one of my stories of which I am the proudest. It does not bring me in one single penny and that is why it has accomplished what it was written for." In The Man Who Planted Trees, the author's adventure commenced in June 1913, during a walking tour through Julius Caesar's ancient Roman province, still so called: Provence. As Giono trudged along the wild, deserted high plateau, he heard the wind growl like a lion over the ruins which lay like black carcasses and rush like ocean waves over the high country. Fearful and exposed, he saw mirages like the gaunt, black silhoutte of a grieving woman he mistook for a dead tree. He met a shepherd, a pastor ministering to sheep, one of those solitary men associated from all time with congregations and Providence. By the end of World War I this same shepherd had become a beekeeper who already resembled God more narrowly by his power to create a new earth. He was planting oaks, beeches, and briches. Miraculously, water was conserved, dry stream beds filled again, and seeds germinated into gardens, meadows, and flowers. In 1993 this planter of trees of seventy-five years of age was clearly one of God's athletes. After World War II in 1913 all had lain waste. The shepherd had performed his solitary work, which Giono hoped he also had done. Both hoped to be worthy of God. The name Elezeard calls to mind some unforgotten Hebrew prophet, wise man, or Oriental king. The last name means in both French and English some thing grandoise: bouffi, bouff'e, that is puffed up (like a great man), puffed out (like wind, or a cloud in the sky). Such an old hero appears remarkably in most of Giono's early fiction, often a shepherd, or else some venerable alcoholic, storyteller, old hired man, or knife sharphener, but usually escorted by beasts: sheep, bees, a bull, a stag, a toad, or a serpent. Such lonely old men in their delirium directly hear the voice of God, or that of some ageless Greek such as the great Pan. One must think of these variously gifted old men as embodying the creative gods themselves, as native survivals in this ancient Provence to which they continuously brought their wisdom, their knowledge of agriculture, their message of life indestructible, all of them teaching, like the titanic Dionysus, the precious secret of humanity's ancient kinship with the earth. When we express pity, Giono used to say, as for a living river cut off by dams, or pity for the helpless suffering beast killed by cruel humankind, then we ourselves resemble the ancient yellow gods who still look down on us from Olympus. Should we not extend our compassion to the forest before it is felled by the woodcutters? This was not original in French literature, of course, but could have come to the child Giono as he read the Fables of La Fontaine in school. His thinking was reinforced by his favorite American "apostles of Nature," Walt Whitman and Henry David Thoreau. In his wonderful story of Elezeard Bouffier, Giono seems to have intended to inspire a reforestation program that would renew the whole earth. His history of this imaginary shepherd, which is a compliment to Americans because of its relationship to the real Johnny Appleseed, calmly veers away from past and present time towards the future of newer and better generations. Giono termed his confidence in the future esp'erance, or hopefulness, not espoir, which is the masculine word for hope, but esp'erance, the feminine word designating the permanent state or condition of living one's life hopeful tranquility. Whence springs this well of esp'erance, Giono wondered? Hopefulness must spring, he decided, from literature and the profession of poetry. Authors only write. So, to be fair about it, they have an obligation to profess hopefulness, in return for their right to live and write. The poet must know the magical effect of certain words: hay, grass, meadows, willows, rivers, firs, mountains, hills. People have suffered so long inside walls that they have forgotten to be free, Giono thought. Human beings were not created to live forever in subways and tenements, for their feet long to stride through all grass, or slide through running water. The poet's mission is to remind us of beauty, of trees swaying in the breeze, or pines groaning under snow in the mountain passes, of wild white horses galloping across the surf. During his lifetime Jean Giono, who considered himself to be Italian and Provencal, in addition to French, was judged one of the greatest writers of our age by such authorities as Henri Peyre and Andre Malraux. Both Peyre and Malraux ranked Giono first or second in French twentieth century literature: Giono, Montherlant, and Malraux (who included himself). Longevity counts most for an author, and Giono's works are still being edited and published after fifty-six years. Giono wrote over thirty novels, numerous essays, scores of stories, many of which were published as collections, plays, and film scripts. In 1953 he was awarded the Prix Mon'egasque for his collective work, and in 1954 he was elected to the Acad'emie Goncourt, whose ten members award the annual Prix Goncourt. Giono laughingly said people in Paris sent him questionnaries because they did not want to read his books. But if we look at one of these documents he answered, we can hear him speak in his usual teasing voice and mood: My ideal happiness? Peace. My favourite fictional hero? Don Quixote. My favourite historical character? Machiavelli. My heroines in real life? There are no heroines in real life. My painter? Goya. My musician? Mazarat. My Poet? Villon. Baudelaire. My color? Red. My flower? The narcissus. My chief character trait? Generosity. Faithfulness. My chief fault? The generous lie. What I want to be? Lenient. My preferred occupation? Writing. In recent years some of Giono's most highly regarded novels have been reprinted by North Point Press and are once again available to English-speaking readers. These are: Harvest (1930), Blue Boy (1932), Song of the World (1934), Joy of Man's Desiring (1935), Horseman on the Roof (1951), and The Straw Man (1958). Jean Giono died, midway through his seventy-fifth year. Read about Jean Giono's free gift of this story to the world. http://www.fruitel.ch/files/doc2.pdf (Document en format pdf; le texte se trouve page 4). http://www.edunet.tn/francais/cadeau/hommequi0.html (Version flash illustrée par des dessins d'enfants).